Finally got a few photos from the offshore trip Friday, sure wish it was like this all the time. Full day trip targeting Mahi, Wahoo and Grouper was a success for sure. We only missed 1 fish on the troll and Limited out on Mahi’s and Wahoo’s. On the way home I stopped to sample a grouper number for the day the wind ever stops blowing again and it was crazy good. Every drop to the bottom was 15-20lb scamp groupers. Go to our Facebook page for pictures or Ill post here later. The King Mackerel are starting to spread out now since the water is warming up but not before we got to keep the lines tight this morning. Just when you think its going to be an awesome day Catching that whole “fishing” thing rolls around. The first few hours was producing steady King Mackerel then it turned to 40-60lb blacktip sharks the rest of the day. Either way the rod stayed bent most of the day so the trip was a success. 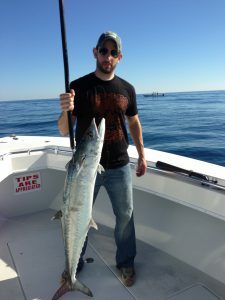 But the real story was this monster Wahoo Capt Austin (clearly hooked) caught beside us today on 20lb test. This is why you go fishing cause you never know. Finally had the wind and the water working together today so we set sail looking for King Mackerel. One thing I saw that was not in our favor was the warm water pushed up inshore of the 100′ mark. Needless to say the whole day was no-stop action with King Mackerel, Amberjacks, Little Tunnys weighing over 400lbs. Looks like it will be several days before the wind lays down for us to try again. Finally made it offshore and all I can say is I hope things change next time we get out. The water looked like you could build a sand castle it had so much sand in it but we did catch some nice kings in the dirty water. Found crystal clear water but no bait or fish to be seen. Also the best signs of life are about 15 miles off the beach with Whales, Dolphins and tons of bait so the Bluefin Tuna needs to get this memo and come on down. Looks like we will be getting a good stretch of weather toward the weekend. 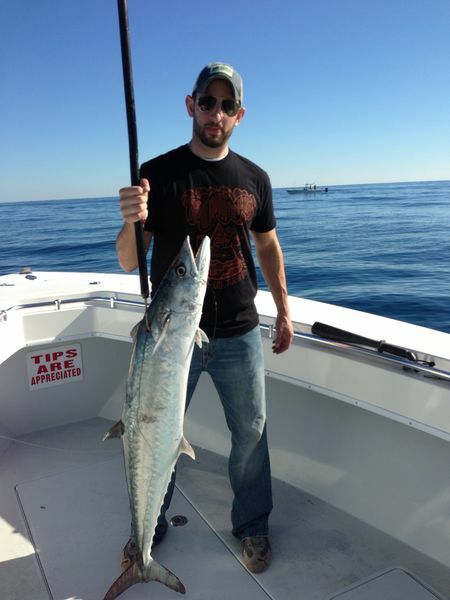 He is one of the many King Mackerel we caught on Sat. This time of year can produce some of the best fishing ever. Today the King Mackerel were all but jumping in the boat for us. We found 68 degree clear water loaded up with bait about 35 miles out and at times had 2-3 fish on at once. Hope to be back offshore Mon. Waiting on pictures. Yesterday was the worst grouper trip I have ever had. Now that is a bold statement but we never caught the 1st grouper, although the Snappers, triggerfish, jacks and blackbass wanted to bite the grouper did not. Im still trying to think of a reason since we have limited out on just about every grouper trip for many years. King Mackerel or Wahoo for the rest of the month since I need some time to let that trip heal itself.